With the beginning on April only a day away, it also means that ANZAC Day is coming soon. This is the day that is a national day of remembrance for Australian and New Zealanders who died during armed conflict. Seonaid from the Auckland Libraries has put the word out that they’re holding the ANZAC Day Blog Challenge again. So if you have a story that you would like to share about an ANZAC ancestor feel free to join in. They’d like to hear about not only their sacrifice, but also the way it shaped your family’s history. Or maybe you’d like to blog from the perspective of those that were left behind? Your story doesn’t have to involve a serviceperson who lost their lives – during times of war, all sorts of loss was experienced. And you are welcome to write about those who served in other wars, not just WWI and WWII. 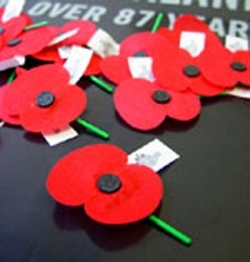 After ANZAC Day, all submissions will be listed in a summary posting on Auckland Libraries’ Kintalk blog. To get you started, Auckland Libraries have compiled a listing of links relating to resources for New Zealand and Australian research, and you might find our post on 51 Links for Australian Military History and Research useful too. Honour your Anzac ancestors, share their story, and Lest We Forget. The Trans-Tasman Anzac Day Blog Challenge is on Again!